Our goal is to work together to create a campaign to promote important women in history. Examples include: Hildegard of Bingen, Anne Hutcheson, Joan of Arc, Abigail Adams, Chapeta, Susan B. Anthony, Elizabeth Cady Stanton, Alice Paul, Lucy Burns, Eleanor Roosevelt, Margaret Higgins Sanger, Milada Horakova, Mother Theresa, Petra Hanáková, and Alice Walker (Author of the Color Purple). 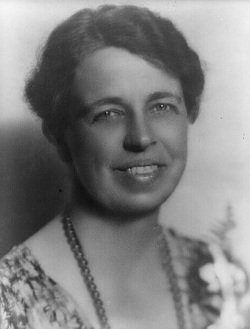 Remember Eleanor Roosevelt's advice, "Do not stop thinking of life as an adventure. You have no security unless you can live bravely, excitingly, imaginatively-, unless you can choose a challenge instead of a competence".